Zavadenko Aleksandra Nikolaevna – МD, PhD, Neurologist, Associate Professor, Department of Neonatology, Faculty of Postgraduate Education. 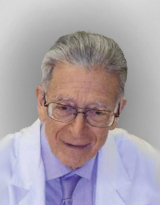 Medvedev Mihail Ivanovich – MD, PhD, Professor, Department of Neonatology, Faculty of Postgraduate Education. Degtyareva Mariya Grigor’evna – MD, PhD, Professor, Department of Neonatology, Faculty of Postgraduate Education. Rogatkin Sergey Olegovich – MD, PhD, Professor, Department of Neonatology, Faculty of Postgraduate Education. Zavadenko Nikolay Nikolaevich – MD, PhD, Professor & Head, Department of Neurology, Neurosurgery and Medical Genetics, Faculty of Pediatrics.